Consistency. Organization. Reliability. If those are qualities you strive for and admire, this is the perfect return address label selection. The basic blue design is the same look you'll find on our traditional Blue Safety Checks. When you order matching checks and labels from CheckAdvantage you create a systemized, uniformed look for mailing out payments and sending business correspondence through the post office. But the best thing about these labels is that they are self-adhesive. That means you can forget about filling out envelopes completely by hand. Simply peel and place! 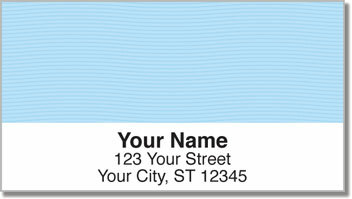 Order your very own Blue Safety Address Labels today. In addition to blue, you can also find safety labels and checks in five other color options.